Here is a lovely colourful soup, low in fat, high in protein and vibrant with healthy yoghurt and spinach. Put a pot of water on heat to boil for the spinach blanching to come. Put the chicken stock into a large saucepan, season with salt and pepper (careful, the stock might have salt) and turn heat on. Put in the rice and simmer for 10 minutes, until just barely cooked. Combine water and cornstarch and make a slurry. Put pan over low heat and bring yoghurt to boiling, stirring in one direction only (either clockwise or anti-clockwise), this is important to keep the yoghurt from breaking down. When the yoghurt approaches boiling state, simmer under the gentlest heat for 10 minutes. Remove the pan from the heat and set aside to cool slightly. Pour the yoghurt mixture into the stock and stir in the lemon juice, blending thoroughly. Keep the soup warm, but disallow it to boil. Blanch the spinach in salted boiling water for a minute or two only, so as to soften but not wilt. Then pour the spinach into a colander and drain well. Stir the spinach into the soup and warm through. Serve with baguettes if desired. The whole spinach leaves add a lovely colour to this extraordinary yoghurt and spinach soup. Great Y choice. I would serve it with your suggestion of some kind of french bread. I've tried to keep white bread at a minimum most of my life but honestly, I love good home baked white bread, slathered in butter. Actually my favorite food. My daughter was hovering a lot while I was down with the stupid neck thing and one evening she asked what I wanted for dinner. I said, "Toast and butter." It was sprouted wheat toast but tasted sooo good with goat milk butter. Sorry, I digressed from Y.
i like both of these, so why not! Oh, yum! 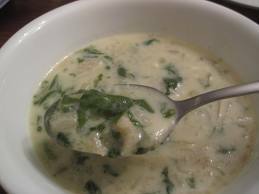 I adore spinach and this soup looks so creamy and fabulous, Anthony. Sounds like an interesting soup. Never thought of putting spinach and yoghurt together. Oh that's a beautifully creamy soup with my favorites-yogurt and spinach. The most tricky part in this recipe is to keep the yogurt from breaking up--your soup looks perfect!! Sounds really good! I love the spinach - yogurt combo! I COULD NOT ACCESS THE INTERNET, SORRY FOR THE DELAY IN RESPONDING. MANZANITA: Bread is just about my favourite food, so I know what you mean. LYNN PROCTOR: Why not indeed, spinach and yoghurt make a great combo. LIZZY: Thank You, it is that. SUSANNE DRAZIC: They make a great combo. #Even raw spinach with a cold yoghurt dressing is good. MALLI: Thank You, we love it too. Stirring in one direction seems to help keep the yoghurt together. MIRIAM: Thanks, you'll love this soup. ELPINIKI: A great pairing for sure. BAYGIRL32: Not even creamed spinach or spinach souffle?